Despite a chequered past John Romero remains the FPS master and is the ideal candidate to freshen up the genre by taking it back to its roots. The thing that hits me first whenever I play a modern first-person shooter (FPS) is just how slow everything is. Slow, linear and, crucially, devoid of that rush. That intense, adrenaline-inducing synergy of incredible geometric precision, brutal face-to-face violence and pure, unadulterated speed. Mike Tyson was right when he said speed kills. Speed does kill. Not just speed of movement, but that of thought and improvisation too. Lack of it or, crucially, lack of potential for it, kills in a bad way. However, turn the afterburners on these characteristics in a space that is designed to maximise potential - typified by fluid, non-linear action - and you hit the jackpot. You approach the core of what the ideal FPS should be. And that is the crucial question that, in light of John Romero and Adrian Carmack's return to the FPS field, gamers should be obsessed with. What is the ideal form of FPS? Is it, as titles such as Counter Strike and Call of Duty lean towards, about juggling multitudinous loadouts, exploiting predefined kill zones and layering auxiliary gameplay systems? Or, is it something far more intangible, elusive and - for want of a better word - liquid? If you look at its roots, both in singleplayer and multiplayer, I feel the ideal FPS delivers a series of high-potential spaces where players can explore and expand the limits of their speed in the most fluid way possible. Levels in FPS need to be, above all, creative spaces. Spaces where the player can exercise their speed in gunplay, movement and creative thinking without constraint. And that is, well at least from my distanced perspective, Romero encapsulated, both in terms of his attitude toward the genre he helped found, and the man himself as an artist. Why do I think this? Well, simple really, by spending a lot of time in many of the virtual worlds he has designed. "[I make] my levels flow so the player will revisit areas several times so they will better understand the 3D space of the level." And that's it, the crux of the matter. If a player, through good level design, is encouraged to seamlessly blend their gunplay, movement and creativity on the fly, if they are freed to maximise the virtual space's potential, then I think you have succeeded in getting to the core of why FPS can be so enjoyable to play. This way of thinking dominated Romero's genre-defining early work and, as he showed recently with his Doom revisit, he clearly still has the talent and philosophy in-tact. And that is why I backed Blackroom no questions asked. The promise of a return to this type of FPS, a return to the dynamic, intense and creative action as typified by Romero's genre blockbusters, is music to my ears. And, what makes Blackroom's potential even greater, is that this time Romero will be designing all the levels. It could, if realised how pitched, be one of the purest FPS ever made. That idea of a pure, back to basics reboot of the FPS genre was enough for me to get excited and enthused about Blackroom, despite the infancy of its development. Who knows what the finished product will be like, as that 2018 release date seems a long way off right now, however if it is anything like Romero and Carmack envision, then it will be the reboot the genre so badly needs. 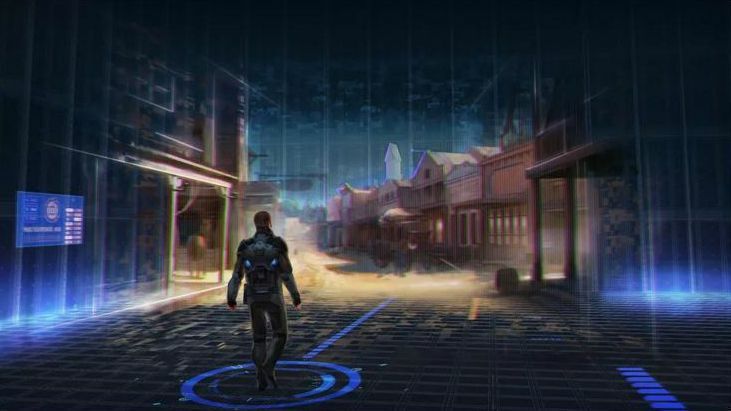 You can check out Blackroom's pitch over on its Kickstarter page.